Is More Makeup Product any Better or Cheaper? I stumbled on a post from a renowned Makeup Artist that many of us know of and his post absolutely shook me to my core. This was months ago and ever since, I’m paying even closer attention than I was before whenever I’m shopping or looking for a new makeup item to add to my kit. The argument of quantity vs. quality vs. price has been a big one for makeup artists and many of us have learned this lesson the hard way, by buying loads of expensive and unnecessary stuff, but I hope that in sharing his post and sprinkling a little of my wisdom on top, I can save new and old makeup artists some makeup dollars and maybe get some regular consumers to start looking at purchasing some new and worthy products. In the below from KJ Bennett’s blog, he measures out the price per gram of some of the most popular eyeshadows that are all considered “PROFESSIONAL GRADE” (minus the Coastal Scents) and we get to see which ones offer us the most bang for our buck. It’s VERY important to note the gram weight vs price of each individual pan. These refill pans look alike due to their diameter, but some are deeper and contain more product. 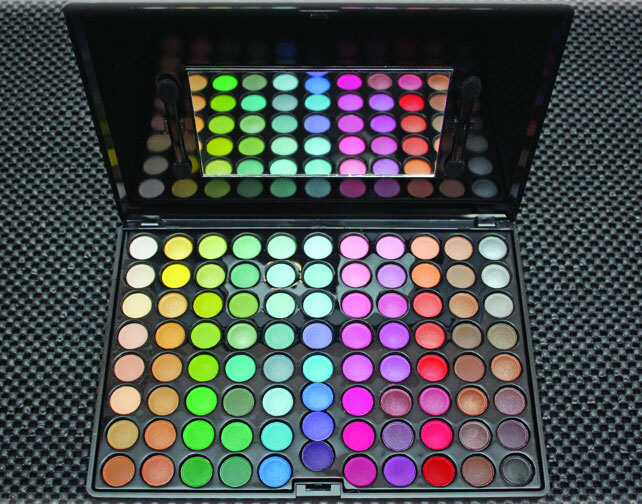 I’m listing from the lowest gram weight to the highest in a standard 1.5″ diameter eyeshadow pan. I even looked at drugstore makeup and was shocked at the prices! It’s not very affordable at all. L’Oreal HiP Studio Secrets Professional Matte Eyeshadow Duo (same 1.5″ diameter size split into 2 half moon pans) is $9.99US. NOTE – I didn’t include the MAC or Inglot refill in the side-by-side list above because they do not use the standard pan size. But here’s the gram weight to price breakdown anyway. Interesting Discovery – Look at the prices per gram …WHAT AN EYE-OPENER! You’ll see that some of the most popular mainstream “Pro” products are quite expensive when broken down per gram. I was actually shocked at some of the prices …even after the discount. BEST BUY – LA FEMME! Their blushes are amazing and at $0.54 per gram, a beginning artist or makeup maven could stock their kit on quite a budget. The pigment is fantastic and works well even on darker skin tones. Second Place: Ben Nye comes in at $1.71 per gram. And, I can confirm that even though the price is insanely low, the quality and pigment levels in the Ben Nye eyeshadows are equivalent to the most expensive pro shadows. SPECIAL KUDOS – Inglot Freedom Palette Refills came in second place. The quality of their matte shadows are amazing for the price. This was an amazing and heart stopping blog post for me! I’m so glad that someone finally did this and measured it out so that we could see in black and where we should put out makeup money. Thanks KJB!